We received a call for two overdue hikers who left an itinerary with family members. About 35 team members were quickly dispatched to the Rancheria Trail, from which they departed, and headed to Tehipite Valley. Because of the detailed itinerary left with family members, finding the hikers was quick, but not easy. The trail into the valley was extremely steep and covered with old debris due to little use. Rescuers found the hikers safe in the valley. They were wise to set up camp and stay put once they realized they could not make it out on their own due to the hazardous and faint trail. The hikers were airlifted out and reunited with family. They were very thankful for a job well done. We were just as thankful to them for making wise choices that lead to such a quick, positive outcome! Two hikers were able to call 911 via cell phone in an area where cell phone service is almost nonexistent. The hikers had become lost. They had set out on a loop day hike to swim in nearby lakes and only had beach towels, a bottle of water and the cell phone for gear. They were advised to stay put. En route to the SAR, another call was received and the response team split up. The Mono response team hiked all night, following tracks and confirming the trail with a scent dog. Six miles later, the hikers were finally reached as daylight arrived. They were cold and tired from a rough night and gladly followed us back to civilization. We received a call for a missing hiker in the Dinkey Lakes area. The hiker had been camping with friends when they decided to take separate routes to summit nearby Dogtooth Peak. About 30 members were split into teams and were sent to search the campsite and surrounding areas as well as the peak itself. Helicopters from various agencies assisted in the search by air. By Saturday morning, the focus was on 10,307 ft Dogtooth Peak itself. In the afternoon, a team on the slopes of the peak heard a possible moan. Once helicopters were called off, searchers called out for a response but received none. Suddenly, one searcher saw movement from what looked to be a rock. That little rock was the missing hiker, dangling from a precarious ledge 600 feet from the summit. With the man exhausted and barely hanging on, teams had no time to set up rope systems for safety. A deputy quickly free climbed up the steep slope and quickly secured the hiker with a piece of webbing. The hiker was conscious with minor injuries and very thankful to still be alive. A helicopter extraction was quickly organized and the hiker was flown to the hospital. The quick, selfless thinking of the deputy, along with the extremely close call, quickly brought international attention to this story. The victim was very pleased with our team and conducted many interviews, including Good Morning America, praising search and rescue teams. We are thankful for his support of our team, and teams like ours, but we are more thankful that he is here with us today and that we were able to save him just in time. On the night on July 31st we received a mutual aid request from Inyo County. They were searching for a mountaineer who was reported missing by his climbing party. The subject had left base camp to summit the over 13,000 ft tall Norman Clyde peak and had never returned. Multiple agencies, including ours, worked together to scour the difficult territory. His ice axe was found and then shortly after his body was found. Searching the area required expert mountaineering skills with steep slopes and glacial ice in abundance. In the early morning hours of August 7th, we received a mutual aid request from Inyo County who was searching for a man that had left his party the day before to summit Mt. Whitney and had never returned. We quickly sent a team to assist in the effort. After a full day of searching, the man was located in the vicinity of Mirror Lake and reunited with his party. Searching the area required mountaineering skills and the ability to adjust quickly to altitude. A search was launched for a missing dirt bike rider who was a day overdue. The man’s truck was quickly located at the Millwood OHV area, a popular spot for various off-roading trails including the difficult ones the subject liked. Searchers scoured the rough terrain and finally found the subject’s bike, helmet and jacket. Two hours after the bike was found, the subject was located. He had walked 20 miles to make it out to civilization on his own. Thank you to the 500 runners, mountain bikers and hikers who made our first annual SAR Wild Run fundraiser a huge success. Also a huge thank you to our donors, team members and families who helped make the event possible. Our fundraiser takes place in August near Shaver Lake and features several different races including both 5K and 10K trail runs through the forest with obstacles and hillside scrambles, a challenging 16K mountain bike ride, and a gentle 2 mile family hike. Many participants commented that the courses were fun, challenging and harder than they expected, but they loved every minute of it. After the events, participants were treated to a BBQ lunch, a beer garden, and music and dancing while waiting for race results. Winners received a beautiful engraved brass compass. Overall, everyone was very happy with the event and we cannot wait to begin planning next year’s Wild Run which we hope will be bigger and even better! Stay tuned for sign up information early next summer at www.sarwildrun.com! For more photos of this year’s event, visit our Facebook page! Our scheduled High Angle training in July was postponed to allow the team to clean up the trails for our upcoming Wild Run event. We ended up having a search the night prior that ran into the morning. Tired from the search, members still showed up and worked hard at getting the courses ready for our big event. With lots of trails to clear, it took more than the one training day to get the course ready. With the many hours so many members volunteered preparing for, and working, our first annual Wild Run, not much time or energy was left to plan training. We improvised and held a team BBQ instead, allowing for team building and downtime after a busy summer. Members brought their families to meet the people their loved ones search with and receive heartfelt appreciation for all they sacrifice. Without the support of our loved ones, we would not be able to spend as much time preparing for and participating in rescues. 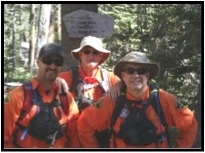 Our annual Summer SAR event was hosted by the Fresno Sheriff’s Office. All the different branches of search and rescue train together on a mock search. Such events give us a rare chance to team build with the other teams, while honing our skills at the same time. We are very appreciative that the Sheriff’s office puts on this event and look forward to it every year. We were very fortunate to have a lot of support from the community this past quarter, both with sponsorships and donations towards our Wild Run event as well as toward the team in general. We would like to thank the these sponsors for their generosity and support which helped make our Wild Run event possible. We look forward to working with you again next year! We would like to thank PG&E for two sources of support. They continue to support us through their employee contribution match program as well as for their additional support through grants and projects such as the fence project. We appreciate your abundant support! And last but not least, we would like to thank Larry Bishop, Mario Reposo, Tamara Brown, and the many anonymous donors who have all made contributions to the team. Your support is greatly appreciated and we look forward to continuing to serve you and the community! In early July, we began our annual PG&E fence project. Over the course of several weekends, the mountaineers worked with the Jeep unit to put up fences in several high-country meadows before the release of the cattle. In addition to installing fences, repairs and removals were done on other fences in areas no longer used. The fence project can be tough work. It includes the removal of downed trees that are blocking the fences and quite commonly involves working in rather mushy meadows. Despite the challenges, both teams work hard to get the project complete on time! Over the month of July, members spent time on the various courses for the Wild Run, clearing overgrown brush in the way of trails and grooming areas to be used for the event. There was so much work to be done with so little time with all the missions that took place during this time. Members put in long, hard hours, even immediately after missions, to ensure the race course was in prime shape for this inaugural event. Crews even worked on the day before the event, managing to get the course ready in time. We look forward to having more help next year to prep the course! In early August, members participated in Del Rey’s Annual National Night Out which was attended by 350 people. Our members showed the kids our communications trailer and how to work the radios. Stations were also setup to teach knots, what to do if lost, and helicopter safety complete with the Sheriff's helicopter on display. A good time was had by all and we look forward to the event next year.